If you’ve ever taken a peek at the inside of an airplane cockpit, you’ve seen the dizzying array of instruments available to the pilot. V-Cockpit GPS from Alexander Gross brings a subset of those controls to your iPhone in beautiful detail. Thanks to your iPhone’s GPS receiver and motion sensors, they animate with surprising realism, providing a fun way to liven up your next journey, even if it’s in a Toyota and not a Cessna. Ready for Takeoff: V-Cockpit GPS displays speed, acceleration, and other measurements in the style of an airplane’s instrument panel. 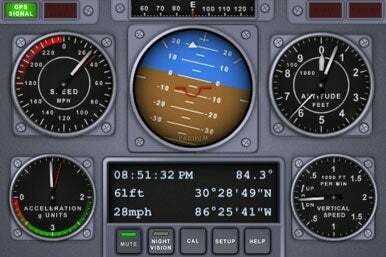 V-Cockpit GPS brings together analog instruments to display speed, altitude, vertical speed, acceleration, heading, and an artificial horizon. There is also a data computer showing a digital summary of key data. With a single tap, you can zoom in on any of these instruments to a full screen. In many cases, a second tap brings up a moving chart showing a real-time data plot versus time. Other details include a night vision mode, a mirror option for the digital data display to create a heads-up display, and radio chatter and jet engine sound effects. There is also a calibration mode to help you get the most accurate readings possible. While all the instruments will work while you’re sitting still, to make the most of V-Cockpit GPS, you’ll want to get moving…fast. To that end, this app is best experienced in a car or better yet, something that will have you pulling Gs and changing altitude. The author wisely points out that V-Cockpit GPS is not to be used while driving or doing other tasks which require your attention so this is best used by a passenger. I only wish it had a trip computer that kept track of statistics like averages and maximums for the various sets of data. V-Cockpit GPS won’t help you get from point A to point B, but it will provide you with a virtual cockpit to make the journey a little more entertaining. To get a feel for V-Cockpit GPS—on sale for $2 as of this writing—you can download a free, limited features version. V-Cockpit GPS is compatible with any iPhone running the iPhone 2.x software update.